This is a throwaway line used by Tom Lehrer on a tape which I grew up listening to with my family on long car journeys. He was talking about Viennese composer and socialite, Alma Mahler. It’s a phrase which rattles through my brain whenever I think about my career or my achievements. It trickles into my thinking when I see announcements of who will be taking on a prestigious new role. And we’ve had a few announcements like that recently. The first time there’s been a director of a national museum younger than me (Nicholas Cullinan), the first female director of Tate, the first ex-Labour MP to become the Director of the V&A. I read the biographies of these talented and marvellous individuals with interest. I try to find out more about their lives and make guesses about their life choices. Not, I hope, in an intrusive way, but because I’m trying to work out how they have made the magic work and what I can learn from it. I have a sneaking suspicion that flexible working, or the elusive quest for work-life balance, may be my own personal glass ceiling. I wonder if that is true for others and what the sector may miss out on as a result. I want more people, especially leaders, to talk about it and to demonstrate new models of leadership that make it seem possible to take on exciting opportunities. Because I’ve also got a new job. I’m going to be joining the National Trust in a week’s time. When I got the job I was thrilled, but also immediately thrown into a turmoil. Even before the interview my husband and I were discussing the possible implications for our childcare arrangements. Would my changing jobs cause the whole house of cards to tumble? Would I have to change how I get involved in family life? Would my children have to adapt to new routines? Would my husband have to renegotiate his hard won flexible working arrangements too? And, philosophically, what was I prepared to offer to a new role? 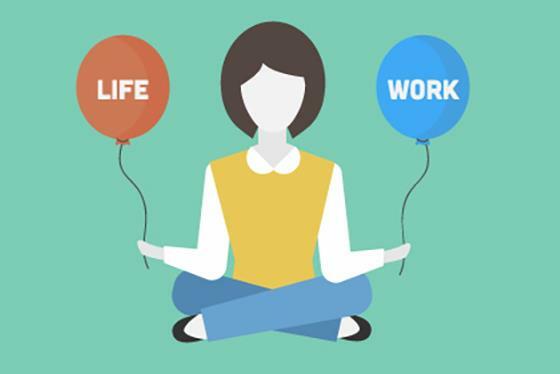 I’m passionate about work-life balance except I don’t think that it should be called that. I think it should be called life balance, because work is part of life. I think we all know when part of our life is out of kilter and impacting on the other parts of our life; and I hope we all recognise when it’s in that sweet spot—not perfect, but manageable. And of course it’s not all about kids. It’s about all of our other responsibilities and interests, our caring roles as well as our community roles. At its essence, life balance is surely about mental health and well-being, the importance of which is becoming better understood year on year. As I grew up, it was a cliché that in order to succeed in one’s career one had to make sacrifices. I’ve always wondered what those sacrifices were and whether it was worth it. And it would appear that the research exists to back my hunch: when Ashridge did its research amongst board-level leaders about what they wish they’d known 10 years ago, one of the key themes that emerged was about life balance—far too many of those interviewed felt that, with hindsight, the personal sacrifices they had made had not been worth it. My father is a vicar. As a child I noticed that, unlike most of my friends’ dads, he was usually there when I got back from school and when I left in the mornings. He was (flip side) out most evenings. I dread to think now about how he felt when I wrote a sarcastic comment in his desk diary, ‘Remember to spend some time with Liz’. Sorry Dad. Tamsin Russell convened a session in the Careers Hub at the Museums Association conference in Glasgow, November 2016, examining just this issue within the museum sector. Three talented and inspirational women explained how they feel they can’t leave their current posts because they might not be able to make equivalent working arrangements anywhere else. They talked about feeling trapped. That can’t be right. I would have enjoyed hearing a male perspective on the issue, or from an employer, to give balance to the debate, but I am delighted it was aired. I benefit from working for an organisation that takes life balance seriously, and where many people work flexibly to adapt to their different circumstances. I’ve chosen to move to another organisation with a similar ethos, and have been bold in my negotiations with them from the start. My approach was to think about what I felt was a non-negotiable in my life to maintain that sense of wellbeing; for me that means physically taking my children to school one morning each week, and picking them up one afternoon each week. The rest of it I am happy to be flexible on around the needs of work and life, if that lynchpin is there. The other part of this equation has to be digital. Technology makes flexible working possible in a way it never has been before. I skype, video conference, telephone, email and tweet from the comfort of my home/ office/ seat on a train without really noticing the difference in my location. I hope that this will erode the presenteeism of the past: it certainly seems to be where I work. At a time of challenge for all our great museums and cultural institutions, I hope the fantastic people who lead and work in them feel like they have a life balance that works for them. I hope we can debunk the myth that to be a leader one has to be ever present, no matter what the impact on one’s own life balance. I hope that more people will feel they can negotiate with their employer for a life balance that works, and that more employers will go the extra mile to support them. I know that if I’m ever to take on a serious leadership role, that’s what it’s going to take.